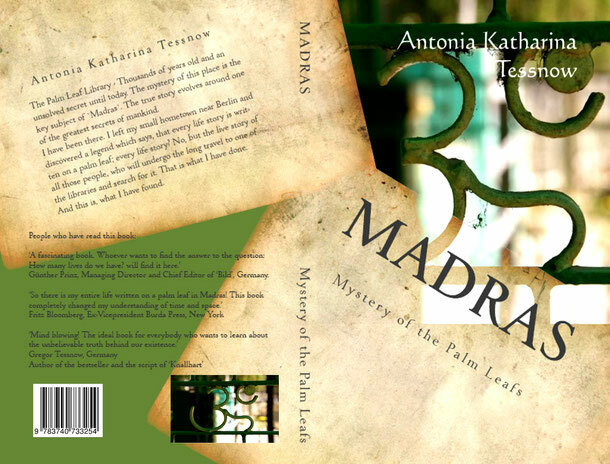 The Palm Leaf Library - Thousands of years old and an unsolved secret until today. The mystery of this place is the key subject of 'Madras'. The true story evolves around one of the greatest secrets of mankind. I have been there. I left my small hometown near Berlin and discovered a legend which says, that every life story is written on a palm leaf; every life story? No - but the live story of all those people, who will undergo the long travel to one of the libraries and search for it. That is what I have done. And this is, what I have found. 1943. It is Christmas. All around the world, children write diaries to somehow cope with the unbelievable experiences they are send through during wartimes and turmoil. 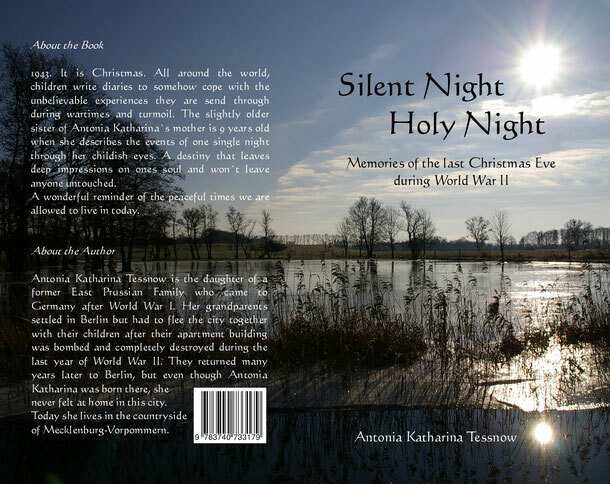 The slightly older sister of Antonia Katharina`s mother is 9 years old when she describes the events of one single night through her childish eyes. A destiny that leaves deep impressions on ones soul and won`t leave anyone untouched. A wonderful reminder of the peaceful times we are allowed to live in today. Antonia Katharina Tessnow is the daughter of a former East Prussian Family who came to Germany after World War I. Her grandparents settled in Berlin but had to flee the city together with their children after their apartment building was bombed and completely destroyed during the last year of World War II. They returned many years later to Berlin, but even though Antonia Katharina was born there, she never felt at home in this city. Today she lives in the countryside of Mecklenburg-Vorpommern. The Astro-Calendar is supposed to serve as a way-wiser throughout the year. It doesn`t only provide the information needed by an astrologer, but also appeals to everyone who feels a deep connection to nature, to the tides and to the orbiting planets around us. 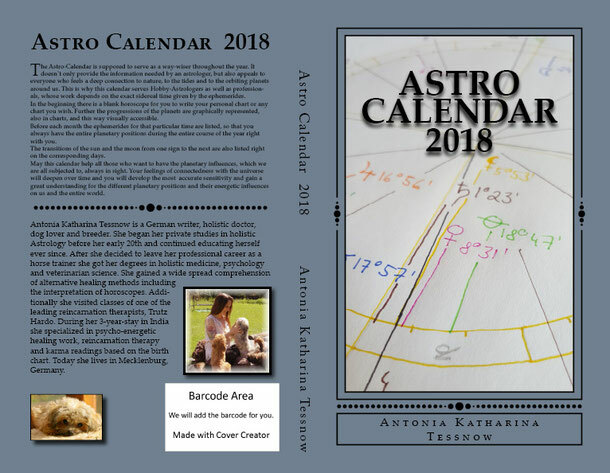 This is why this calendar serves Hobby-Astrologers as well as professionals, whose work depends on the exact sidereal time given by the ephemerides. In the beginning there is a blank horoscope for you to write your personal chart or any chart you wish. Further the progressions of the planets are graphically represented, also in charts, and this way visually accessible. Before each month the ephemerides for that particular time are listed, so that you always have the entire planetary positions during the entire course of the year right with you. The transitions of the sun and the moon from one sign to the next are also listed right on the corresponding days. May this calendar help all those who want to have the planetary influences, which we are all subjected to, always in sight. Your feelings of connectedness with the universe will deepen over time and you will develop the most accurate sensitivity and gain a great understanding for the different planetary positions and their energetic influences on us and the entire world.